Takeji Asano - Born in Kyoto, Takeji Asano worked in both the shin-hanga and sosaku hanga Japanese woodblock print traditions. He studied Western and Japanese painting, and became interested in woodblock prints after taking a class with Hiratsuka Un'ichi, one of the founders of the sosaku hanga or creative print movement. In 1929, he helped form the Kyoto Creative Print Society. 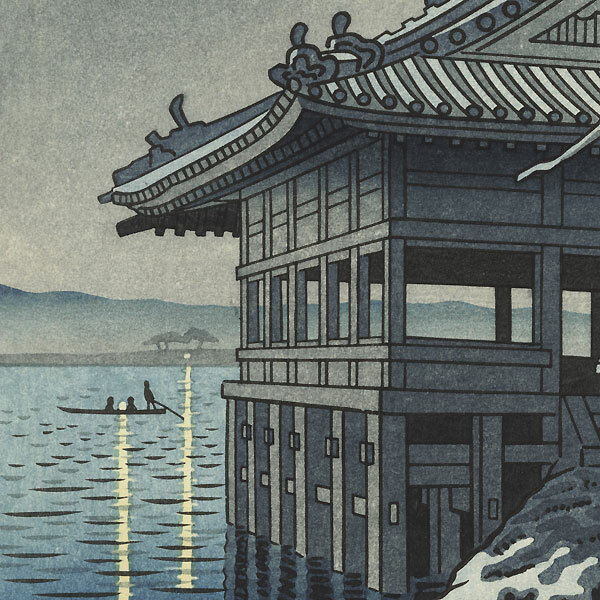 After WWII, he created many woodblocks of scenery and famous sites in and around Kyoto in various seasons. 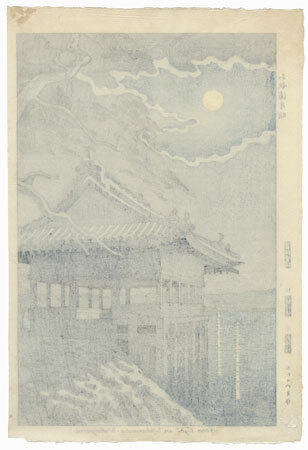 In addition to designing shin-hanga series for Uchida and Unsodo, he also published his own works. His colorful sosaku hanga woodblocks, self-carved and self-printed, have a real graphic appeal, with bold line work, sweeping views, and handsome compositions. Asano's prints are a great choice for the modern collector, and make attractive framed displays. Comments - Handsome evening view of Wakanoura in Wakayama on a moonlit night. 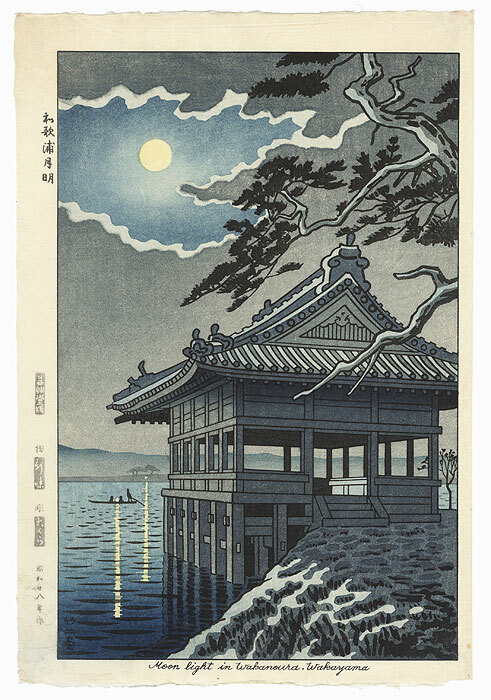 The full moon glows yellow in the sky, its light reflected on the shimmering water below, the temple shadowed in blue gray. A lovely subdued color palette in muted blues and grays. The first time we've offered this subject. Condition - This print with excellent color and detail as shown. Slight paper remnants on reverse at left corners from previous mounting. Slight toning. Please see photos for details. Nice overall.